Since 1985, John’s Automotive Inc. has been a complete automotive service provider for drivers throughout Jacksonville, FL. Whether you need routine maintenance or an engine overhaul, we can do it all. We service all makes and models of cars and trucks, and even work on diesels. Give us a call or drop by our shop today! A good auto mechanic in Jacksonville, FL can keep your vehicle running smoothly for as long as you own it. They’re your partner for routine maintenance, unforeseen repairs and more, which means it’s important to put your trust in an auto repair shop that has a history of superior workmanship and satisfied customers. John’s Automotive Inc. is here to be your partner for auto care and repair, with a reputation that stretches back 30 years and the know-how to fix just about anything that might be wrong with your vehicle! No matter what you’re driving or what type of service you need, our shop of highly-trained techs is here to deliver it. Whether you need a complete engine rebuild or you’re just in for an oil change in Jacksonville, FL, trust that our team can tackle the job with precision and poise. We’re no stranger to major automotive repair projects and we take pride in never turning down a job. Instead, we’ll find a way to deliver exceptional results and top-notch customer satisfaction. Come to us for brakes, radiators, transmissions, auto AC, suspensions, tire changes, oil changes, engine repair and more! We enjoy what we do and it shows in the quality of the workmanship we provide to our customers. We’ve been serving Jacksonville, FL-area motorists for more than 30 years! Our shop welcomes all makes and models of cars and trucks, including diesels. 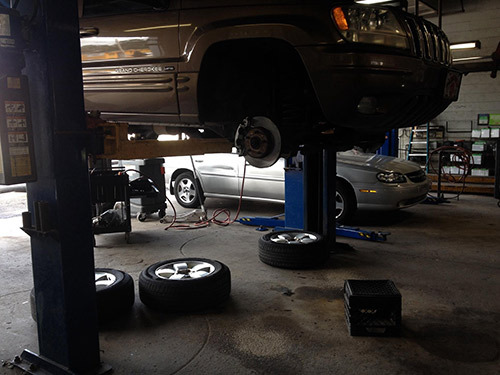 Our staff is comprised of ASE-certified mechanics. We’re a Certified NAPA Auto Care Center, honoring all NAPA warranties. Our shop is family-owned and –operated, built on honesty, integrity and excellence. When you need auto maintenance or repairs, treat your vehicle to the highest level of service and schedule an appointment with John’s Automotive Inc. Contact us today to get started!